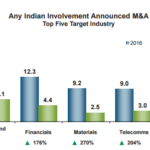 NEW DELHI: Calendar 2016 was a year of big-sized merger and acquisition (M&A) deals for India Inc, with data showing a record high $72 billion worth of agreements during the year, even as the number of deals stood the same as in 2015. At $72.4 billion, M&A deals rose 97.10 per cent in 2016 compared with those in 2015. The M&As announced in 2016 beat the record of $67 billion deals announced in 2007, thanks to 15 M&A deals of $1 billion or above during the year by. There were only four deals of this size in 2015.